Having launched less than a year ago, iBillionaire has managed to raise over US$1 million in funding and is about to embark on a new endeavor – an ETF. iBillionaire’s story isn’t that of your typical Latin American startup, nor are its ambitions. Having launched less than a year ago, the company has managed to raise over one million dollars in funding and is about to embark on a new endeavor – an ETF. The caliber of the startup’s international group backers is a strong indicator of just how much potential it has. French fund Newfund Management has added iBillionaire to its portfolio, and leading Latin American seed fund NXTP Labs has made a follow-on investment as well. The company is also backed by big-name angel investors in the region, including Alejandro Estrada of DineroMail fame and OLX founders Alec Oxenford and Fabrice Grinda. As mentioned, the path upon which iBillionaire has embarked is a unique one, and we’ve been following it for quite some time. iBillionaire is the brainchild of Ecuadorian entrepreneur Raul Moreno, previously of Kinetik fame (an app discovery platform killed by Apple). Moreno and the iBillionaire team, including co-founder Estrada, originally launched a mobile app in April 2013, following up with a web platform in August. And in November of last year, we finally started to see just how ambitious the startup is with the launch of the iBillionaire Index. “The index was always in the plan, and I think it was a natural step for us,” Moreno commented at the time. And now, iBillionaire is moving on to another and even bigger step – an exchange-traded fund (ETF). 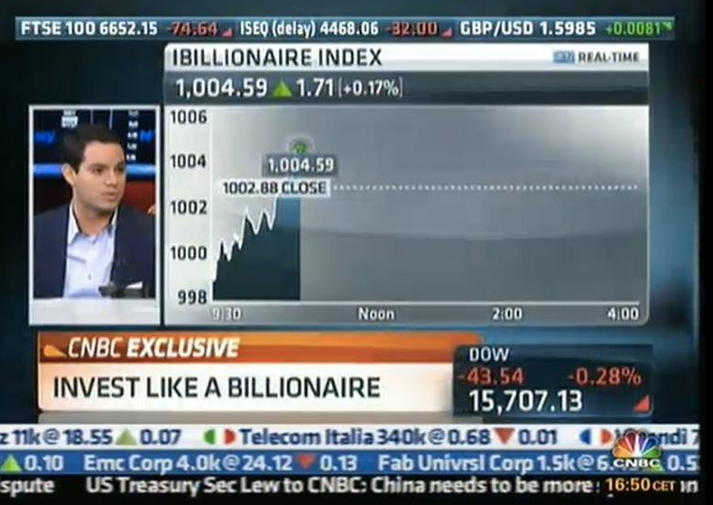 Moreno announced the launch of the iBillionaire Index on CNBC. 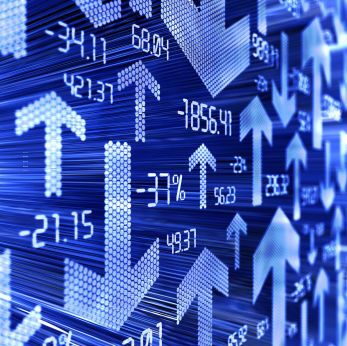 For those not familiar with the term, an ETF is an investment fund traded on stock exchanges. They hold a diversified portfolio of stocks and securities and may be traded throughout the day. Generally considered quite cost-effective equity investment alternatives, ETFs are constructed to track the performance of a specific index. There are approximately US$2.4 trillion invested in ETFs globally, included US$362 billion in the S&P 500 alone. iBillionaire says it hopes to capture 1% of that amount – US$3.6 billion – within the next five years. The iBillionaire ETF will be based on the iBillionaire Index (NYSE: BILLION), which employs a proprietary algorithm to filter the stocks listed on the S&P 500 to identify top performers. How? By following what the billionaires do. The iBillionaire team tracks the investment portfolios of la crème de la crème on Wall Street, such as Warren Buffett, Carl Icahn and Daniel Loeb, and identifies in which 30 stocks they have allocated the most funds. “In essence, the index works as though one gathered a group of these billionaires in a room and asked them to come to a consensus as to which S&P 500 stocks are their best bets,” explains Moreno. You can also see a more in-depth explanation of the index here. iBillionaire has grown leaps and bounds in just a matter of months. With an ETF on the horizon and shifting into the make-it-or-break-it world of finance, the stakes get even higher. When it comes to Latin American startups thinking big, you can’t get much bigger than this.